Ansonia "MUNICH" , circa 1900 Enameled Iron case with gilt decorated ornaments. Case: Enameled Iron. 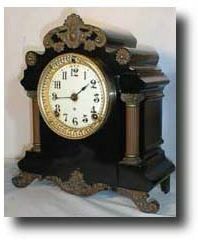 11.5" tall Works: Ansonia 8 bay time and strike on gong.. Reference: Ansonia clocks by tran Duy Ly.